We arrived safely at Base Camp with minimal hassle. Our time here was pretty chilled out. There was a lot of tweaking of gear, rigging of sleds (a.k.a pulks) and agreement about how to travel as rope teams over glacial terrain. Our personal tents for the expedition were Hillberg Saivos which slept 2 persons comfortably and three plus expedition gear a lot less comfortably. The Saivos proved to be completely bomb-proof throughout the whole expedition, resistant to the adverse weather conditions and our man-handling of the tents. The cook tent was the outer shell of the Hilleberg Keron 4 GT. This was erected on the snow, with steps, dug down from the entrance into a recessed galley that could seat four people on either side. At the far end of the galley there was a serving bar, and at the far side of the bar, another standing area for the cook(s). This tent was to be the social hub of the expedition. Little did I know that further up the mountain this would be my home for some nights. At base camp we feasted on pasta and cheese, salad, garlic bread, veggie burgers, tea coffee, hot chocolate, fresh fruit, freshly warmed cinnamon rolls and much more. Toilet procedures for the expedition were dictated by the National Park Service. We were issued with multiple “Clean Mountain Cans”, a.k.a. CMCs, plus plenty of biodegradable cornstarch liner bags. I won’t go into the gory details, though for a long time I shall not be able to shake out of my head the hands-on demonstration provided to us, and the guides’ insistence that we do not fear the can lest we end up with obstructed bowels, and to ensure we created a seal with the can whenever we used it. The result was a toilet facility that is significantly more hygienic than many other mountains, although there was the curious issue of people sneaking over to your can in the middle of the night and filling it up with their ‘deposits’, leaving your team to walk to the nearest assigned crevasse to toss the bag in the morning. Eww. The weather at base camp was mainly sunny, reaching the high twenties (Celsius), but with periods of snow, hail and rain. Wind at base camp was negligible. There was also twenty four hours a day of daylight. The unexpected heat did not do the CMC any favours when left out in the hot sun, and being snowed upon whilst being hot and getting sunburnt is a first for me. When we weren’t eating, sleeping or re-packing or going over travel technique, we were treated to exceptional displays of avalanches from the valleys around us. 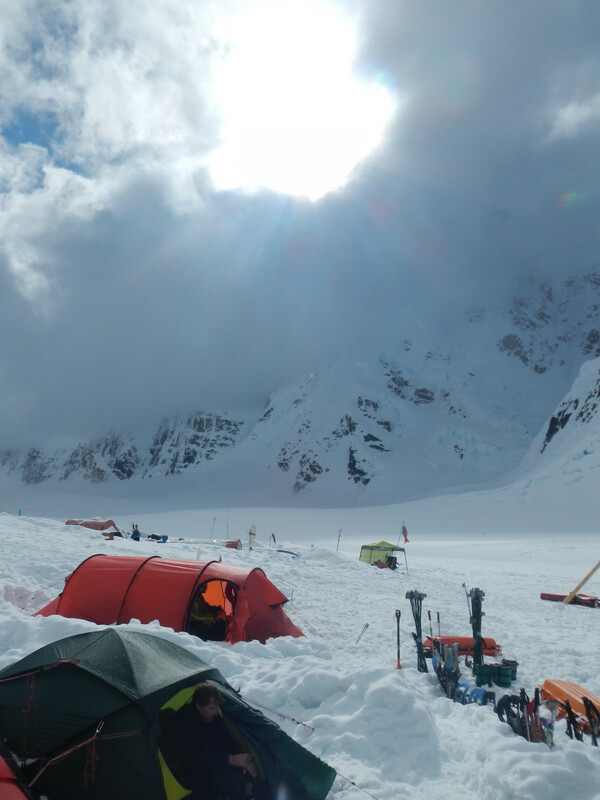 The views of Hunter and Foraker were impressive when the clouds opened up, and when it got too hot, we would retreat into the tents for shade and endure temperatures in the tents of up to 31c. Some in our team even caught a glimpse of a rogue bear on the glacier!